The site of public executions for hundreds of years, it’s generally accepted that at about 9am on 3rd November, 1783, John Austin became the last person to be hanged there (for more on the history of executions at Tyburn – and in particular the massive gallows known as the Tyburn Tree – see our previous post here). Austin had been convicted of being a highwayman – specifically for inflicting “robbery with violence” upon labourer John Spicer, two weeks before during which Austin had attacked Spicer, beating and cutting him, “in a cruel manner”. As he stood on the cart beneath the gallows (a mobile gallows had been in use since 1759 when the Elizabethan-era Tyburn Tree was dismantled), Austin’s last words were somewhat predictable – he requested that the crowd pray for his “departing soul”, that they would heed his example and that Jesus would have “mercy upon my poor soul”. His death, it is said, was “hard”. As the cart was moved off, the halter around his neck apparently slipped “to the back part of his head” and instead of his neck being broken, Austin slowly choked to death. The decision to cease executions at Tyburn (near where Marble Arch now stands) and move them to outside Newgate Prison was apparently due to complaints. These came from both City traders who felt the condemned person’s three mile procession from Newgate to Tyburn disrupted making money and the fashionable who sought to live in the city’s outlying western areas like Marylebone and who didn’t want to see the unruly mob that typically accompanied outside their front doors. Such groups had long been lobbying for the practice to come to an end. 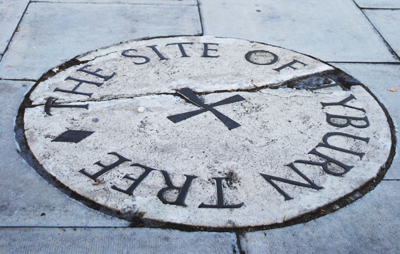 For more on the history of Tyburn see Robert Bard’s Tyburn: The Story of London’s Gallows . The decision to cease executions at Tyburn and move them elsewhere was indeed due to traders’ concerns for losing money. But one would have hoped that by the late 18th century, civilised populations would have moved past the gross “thrilling” spectacle of murdering criminals.